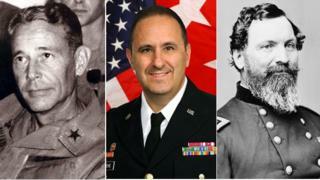 Maj Gen Harold Greene, killed by an Afghan soldier in an insider attack, follows a long line of US generals killed in war. And their deaths say much about the changing nature of warfare. In the past decade, thousands of American soldiers have lost their lives to the wars in Iraq and Afghanistan. Yet news this week of Maj Gen Harold Greene's death made headlines. Gen Greene is not only the highest ranking US military official to have been killed since the start of the war in Afghanistan, his death also marks the first time in more than 40 years that a general has been killed in combat. Although it's now a rare occurrence, before modern technology and tactics, the deaths of senior officers were far more common. Gen John Sedgwick was the highest-ranking Union official killed on the battlefield during the United States Civil War. "They couldn't hit an elephant at this distance," he allegedly said to his colleagues during battle, right before he was shot and killed by a confederate sharpshooter. Like many wars in the 19th Century, the American Civil War was particularly lethal for high-ranking officials due to the nature of combat at that time. "In the Civil War, soldiers were more densely packed and fighting in lines," said Richard Kohn, a military historian at the University of North Carolina at Chapel Hill. "Brigadier Generals were often leading the brigades so they were in greater danger given the tactics and weapons involved." Following the US Civil War, many career officers served on the front lines of the American Indian Wars. However, unlike the Civil War, the fight for territory in the western frontier was asymmetric, lasting decades. Gen Edward Canby was the only US general killed during the American Indian Wars, and at the most unlikely stage possible. At peace talks in northern California with the Modoc tribe, he was assassinated by treaty negotiators. "It was once common for generals to share the fate of the ordinary soldier," says Boston University political scientist Andrew Bacevich. "There was once a common used phrase - 'fighting generals' - those who stayed on the front lines." "In the US Civil War, it was quite common for generals to be killed. In World War Two, the odds were substantially lower," says Stephen Biddle, a military expert with the Council on Foreign Relations. "As weapons' ranges increased, the headquarters tended to move to the rear, to get them further out of harm's way." As military technology and tactics changed in Vietnam, so did the nature of the war. Because of the lack of distinct frontlines, many commanders would lead their battalions from helicopters above the battlefield, radioing commands to their soldiers below. "In the Vietnam War, the helicopter was the platform that seemed to provide the most effective means to command and control operating forces," says Bacevich. "For those who believed the Vietnam War was a military failure, they said it was a failure of command. One example was the tendency to try to control ground operations from a helicopter above." "In modern times, the American military has become more bureaucratised," says HW Brands, a historian at the University of Texas. "These days it takes a long time to become a general - 25 years - whereas in the Civil War, people became generals after three months in battle. The army will not put someone with 25 years training on the field."